What's it like to record in Prince's studio? Paisley Park visitors who purchase VIP tour tickets on Thursdays now have the opportunity to record themselves singing part of a Prince song — right there at one of the most legendary studios in music history. 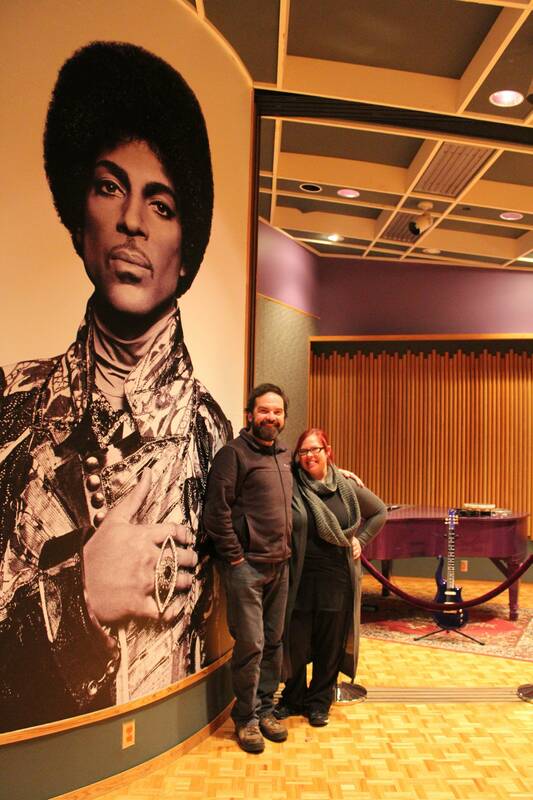 Last week, The Current's Brian Oake and Jill Riley visited Paisley Park, and Jill took the opportunity to have a studio engineer record her singing part of "Raspberry Beret" along with a backing track of Prince's vocals. Above, listen to Jill's take on the 1985 classic — and listen to Brian and Jill talk about their visit, in an excerpt from their show on Friday morning. "It was a really cool experience," remembered Jill, who was a huge fan of their tour guide, Mitch. "You can tell he was a huge Prince fan and really passionate and really knew his stuff." Brian praised the Paisley Park tour. "Sitting behind the board where Sign O' the Times was recorded, seeing his inner workings, how he lived...you got the sense that he was this incredible, towering, almost impossible talent, but also just a regular dude who liked to plop down on the couch and watch basketball games." When artists flocked to Chanhassen: Paisley Park's days as recording and business hub "Paisley Park," the phrase, is everywhere in Prince's past. It's a song from his 1985 album Around the World in a Day; it's also the name of Paisley Park Records, a label, active from 1985 to 1994, that signed artists such as Sheila E., Carmen Electra, and Mavis Staples. Most notably, the phrase serves as shorthand for Paisley Park Studios, which officially opened on Sept. 11, 1987. Inside Paisley Park: What do visitors see? Visiting Paisley Park today is obviously a very different experience than it was during Prince's lifetime. What was once a mysterious wonderland full of flickering candles and bursting with extremely loud music is now experienced by fans as a series of rooms to be moved through in a (more or less) orderly manner, conducted by enthusiastic but callow guides. Prince's Paisley Park burial urn: Eden Prairie artists share details The biggest revelation when Paisley Park opened for tours yesterday was that the studio has become Prince's final resting place: his cremated remains reside in the venue's atrium, in an urn that resembles a miniature Paisley Park. Photos from Paisley Park With Paisley Park officially open for tours after some unsure times in October, the estate held a media tour day on Wednesday, November 2. Many reports have already shared words on what Prince's home is like, but for this tour, Paisley Park promised something almost unprecedented: the chance to take photos inside four rooms. Paisley Park announces Celebration 2017: Four-day gathering to mark anniversary of Prince's death "Celebration 2017," which will take place at the Chanhassen venue from April 20-23, is billed as an event "bringing together musicians, creative personnel, special guests and friends who worked closest with Prince and knew him best, these four days will feature live music, panel discussions and presentations on Prince's tremendous talent, influence and importance as a composer, musician, producer, live performer and filmmaker."